Does the zealous pursuit of public health with respect to obesity cause private harm? The Nutrition Resource Center of the Ontario Public Health Association asked some hard questions in a day-long symposium leading up to the opening of the Fourth Canadian Obesity Summit. Messages from the media, industry, and even some health professionals and public health campaigns often convey the idea that obesity can be prevented by simply eating less, eating better, and moving more. This reinforces the idea that obesity is a matter of lifestyle choices and personal responsibility. Distinguished speakers engaged in diverse areas of research, public health, and advocacy explained that obesity is not really that simple. Arya Sharma delivered the keynote lecture to explain obesity’s complexity and the harm that simplistic messages can cause. Bias, stigma, discrimination, disordered eating, and unhealthy body images are among the harms that are seen. Other speakers explored the role of the food environment, social determinants of health, public perceptions of nutrition, and emerging observations about food addiction. Ximena Ramos Salas presented her work on unintended consequences of public health messages about obesity. She explained how people with obesity find shame and blame in some public health messaging, making it more harmful than helpful. A key message from this discussion is the importance of focusing upon holistic health more than weight. 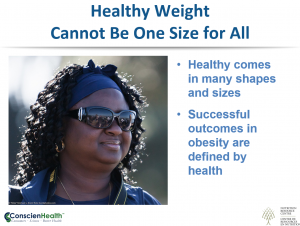 In presenting about finding the right words to promote health, ConscienHealth founder Ted Kyle pointed out that the concept of healthy weights can be problematic because one size will never fit for all. The antidote for stigma is respect. Click here for more information on the program and here for Kyle’s presentation.